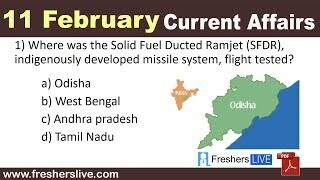 Current Affairs 11th February 2019: Instantly obtain Latest Current Affairs 11th February 2019 with all essential info, Be the first to know all the Current affairs 11th February 2019 top news, Major Issues, Current happenings, Important events in National as well as International level with clear explanation. For all competitive exams and Interviews, equip yourself with the Latest Current Affairs 11th February 2019 granted here. Prime Minister Narendra Modi formally inaugurated the Hollong Modular Gas Processing Plant (HMGPP) of Hindustan Oil Exploration Co. Ltd. (HOEC) at Dirok Field in Assam. The HMGPP will initially have a capacity to process 35 million standard cubic feet per day of gas equivalent to 15% of Assam gas production and 800 barrels of condensate. Dirok Field is being developed in phases by HOEC along with its JV partners - Oil India Ltd. and Indian Oil Corporation. February 10, 2019, was the first-ever World Pulses Day, a United Nations global event to celebrate pulses worldwide and continue the important gains made with the 2016 International Year of Pulses. The aim is to celebrate, raise awareness and promote the consumption of pulses at events around the globe. The book “Law, Justice and Judicial Power – Justice P N Bhagwati’s Approach” written by Mool Chand Sharma was launched by the Chief Justice of India, Shri Justice Ranjan Gogoi. The first edition of the book was received by President Ramnath Govind. The Abu Dhabi Judicial Department has added Hindi as the third official language of the city’s courts. Arabic and English are the first and second languages. The move is aimed at helping foreigners to learn about litigation procedures, their rights, and duties without a language barrier. It also aims to facilitate registration procedures via unified forms. Abu Dhabi is the capital and the second most populous city of the United Arab Emirates.